On the surface, Aunt Maria seems like a cuddly old lady, all chit-chat and lace doilies and unadulterated NICEness! When Mig and her family go for a short visit, they soon learn that Aunt Maria rules the place with a rod of sweetness that’s tougher than iron and deadlier than poison. Life revolves around tea parties, while the men are all grey-suited zombies who fade into the background, and the other children seem like clones. The short visit becomes a long stay, and when all talk of going home ceases, Mig despairs! Things go from bad to worse when Mig’s brother Chris tries to rebel, but is changed into a wolf. Mig is convinced that Aunt Maria must be a witch - but who will believe her? It’s up to Mig to figure out what’s going on. Maybe the ghost who haunts the downstairs bedroom holds the key? Perhaps I am too old for this sort of book, but it's not stopped me enjoying it. 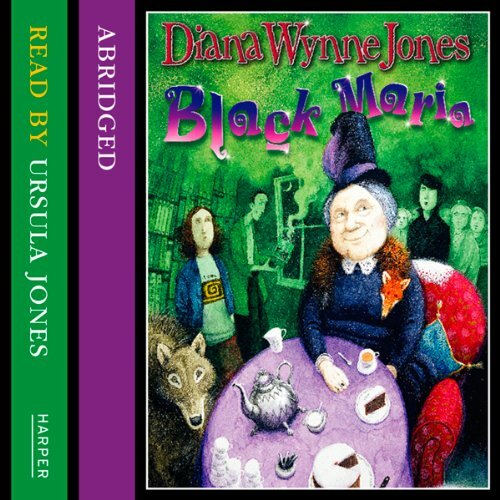 I discovered Diana Wynne Jones after watching the animated film of Howl's Moving Castle. Ever since I have dipped into her books now and again. This is quite different to the Moving Castle series, the plot moves at a faster pace and the feel of the book is more claustrophobic. Aunt Maria is much like Dolores Umbridge from Harry Potter, pleasant on the outside, evil on the inside. Which makes her a far more formidable sort of character. I enjoyed the way that Ursula Jones read the book, her selection of voices were impressive and suited each character well.